When I started reading comics regularly about ten years ago, I was of the opinion that DC had a far and away better cadre of female talent, both in creators and characters. But an influx of female talent joined Marvel around the time Gail Simone left Birds of Prey, shifting the balance between the Big Two. One of the most prominent amongs this new wave of women in comics was Kelly Sue DeConnick, who revitalized the somewhat pointless Avengers Assemble by making it the home of Bendis-style witty banter now that Jonathan Hickman has taken over the two main Avengers books. Her main project, however, is the promotion of the long-suffering Carol Danvers from Ms. Marvel to Captain Marvel, positioning her as one of Marvel’s answers to Wonder Woman. (The other candidate for that role is Sif, who perhaps not coincidentally is also in a book by a female author -- Kathryn Immonen’s Journey Into Mystery.) 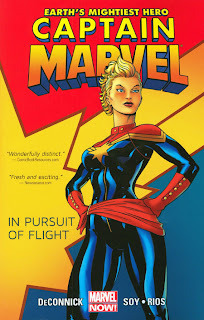 The first collection of DeConnick's series is Captain Marvel: In Pursuit of Flight. One of Carol’s central characteristics is that she’s solidly military and has been so since her first appearances. It’s one of the reasons why her promotion to Captain has been long-overdue -- as Captain America jokes early on in In Pursuit Of Flight, Carol outranks him in the military hierarchy. The role of women in the military is a key theme throughout the volume; it’s fitting that this review is being written shortly after the lifting of a number of restrictions on women in combat. Time travel strands Carol back in the era of one of her idols, a female pilot named Helen Cobb, and DeConnick uses the previous strictness of gender roles to point out how qualified female pilots were left out of the space program. DeConnick tackles more gender roles with the appearance of the Banshee Squadron, a group of 1940s female pilots patterned after the Howling Commandos, Easy Company, and other similar soldier groupings. The Banshees strike the delicate balance between femininity and power, and although they’re out of the book after a few issues, there are still strong hints that we’ll see more of them as the title soldiers on. It eventually turns out that the explosion that gave Carol her powers is also tearing a hole through time, and there's an indication that the events in In Pursuit Of Flight are happening on something of a loop. We eventually revisit Carol’s origin and experience how it could have gone very differently. The artwork is primarily split between Dexter Soy and Emma Rios, and both artists bring their own strengths and weaknesses. However, the first art you’ll encounter comes from Jamie McKelvie’s new Captain Marvel costume design and Ed McGuinness’ cover. I’m used to a comic’s creative team coming up with the costumes, and it might explain why Dexter Soy wasn’t the best choice to draw Captain Marvel. His art is very angular and stylized, with a heavy reliance on “lens flares,” shading, and other visual effects. Richard Elson, Karl Kesel, and Al Barrionuevo all contributed bits towards the ends of issues, and the result is a very uneven look and read. Captain Marvel’s new hairstyle is strange no matter who draws it, and no one can figure out if it’s supposed to be a mullet, a Mohawk, or some unholy mix of the two. The shift to Emma Rios’ artwork is incredibly abrupt, in part because it actually goes from Soy to Elson to Kesel and then finally to Rios within a space of about six pages. I’m not entirely sure why they couldn’t have one artist finish issues #4 and #5, especially since Kesel and Barrionuevo are each popular enough that Marvel could have given them their own guest issues. Thankfully, the quality of Rios’ work is worth the confusion, especially because she must deal with one of the greatest dangers an artist has to face: drawing a bunch of people who look identical in their civilian forms. George Perez famously made Captain America, Hawkeye, and Giant-Man look distinct without wearing uniforms, and similarly, Rios differentiates the blonde Carol and Helen by adding a reddish tone to the former’s hair, which looks really good. Despite some quibbles with the art -- which gets better as the series continues -- the new Captain Marvel is one of the best books Marvel is putting out. It predated the Marvel NOW! initiative” but was quickly rebranded to be a part of it. Between this book and Avengers Assemble, Kelly Sue DeConnick has come into her own as one of Marvel’s top writers. At the very end of Captain Marvel: In Pursuit of Flight is Carol’s OHOTMU profile, an extra that should be mandatory in the first volume of any series. You can read through her troubled past and then experience the rebirth of Carol Danvers as the new Captain Marvel firsthand. If I were DC, I would sue Marvel over that cover. It's a clear rip-off of DC's Captain Marvel's iconography and would easily confuse a casual comics reader into thinking this character had something to do with Billy Batson. "World's Mightiest Hero" is a slight tweak of the tagline "World's Mightiest Mortal," owned and likely copyrighted by DC for years. I realize that Marvel owns the copyright to the Captain Marvel name, but they definitely don't own the specific properties of the DC version. This is a shameless stunt by the House of no ideas. It's a bit distasteful, and there are far better covers that they could have used, but Marvel is within their rights to use the wording "Earth's Mightiest Hero". It's the Avengers tagline applied to a single character. The entire Captain Marvel name usage situation is something I specifically wanted to stay out of.